We Guarantee you'll love your Window Coverings! With the Hunter Douglas Right Choice Promise™ you can make your choice with confidence. If you are not completely satisfied, Hunter Douglas will exchange them for you. 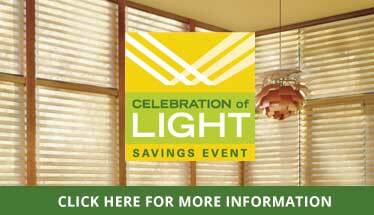 This program is exclusive to Hunter Douglas Gallery® showrooms. Once the installation of your new Hunter Douglas window coverings is complete, we invite you to experience and enjoy them in your home for 21 days. In the unlikely event you’re not thoroughly satisfied with the way they visually enhance your home at the end of this 21-day period, contact us during the next 21 days. For a nominal fee (not to exceed $75 per window covering), we will make a one-time replacement of your window coverings with a Hunter Douglas product of equal or lesser value of your choice. * It’s that simple. *The Right Choice Promise applies only to residential installations. It excludes: damage and abuse, improper installation, mis-measurement, product stacking or control side change, hard-wired motorized products and specialty shapes requiring templates. Change in product size (i.e., inside mount to outside mount or vice versa) is excluded. An additional re-installation charge not to exceed $75.00 per window covering may be required. If the replacement product is of greater value, you must pay the difference in value. No credits or refunds for products of lesser value. Claims must be made by the original customer through the original Hunter Douglas Gallery® dealer. The Right Choice Promise™ is available only through participating Hunter Douglas Gallery® dealers.